Welcome to Day 11! Now that gameplay is out of the way, we are going to focus on the UI by implementing more screens and adding transitions using the Tween Engine by Aurelien Ribon. 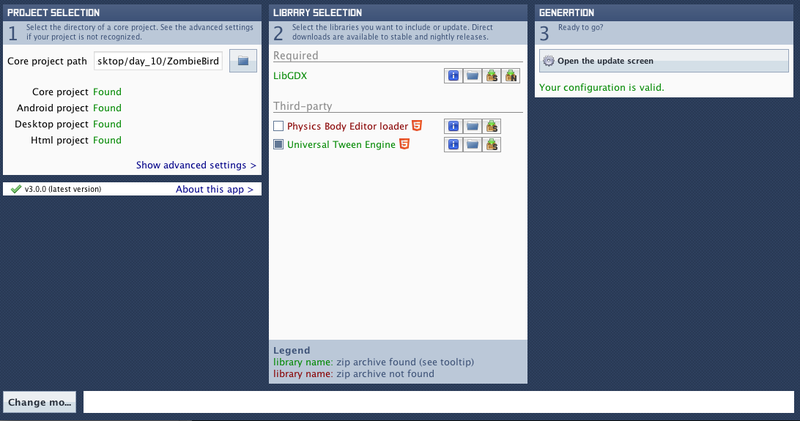 In Day 2, I asked you to download the Universal Tween Engine through the libGDX setup. 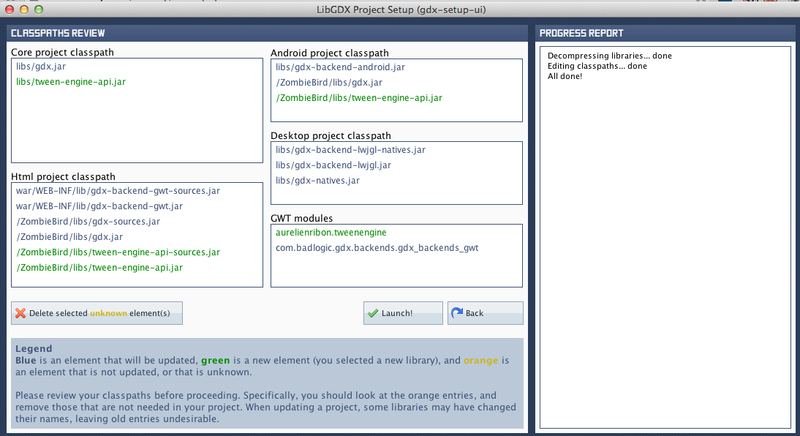 I forgot to click the checkbox next to the Universal Tween Engine after downloading, so I have to use the libGDX setup to update my project. 1. Find out where your core project is located. This can be found by right clicking (Control + click on Mac) on the project, and opening the Properties. Take note of the file Location. 2. Open up the gdx-setup-ui jar, like we did in Day 2. If you need to download that again, click here. 3. Specify the core project path as shown below. 4. 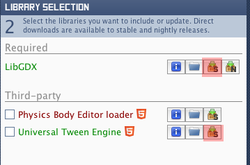 Make sure you select "Universal Tween Engine" by clicking the checkbox. 5. Click the 'Open the update screen' to the right. 6. You should see the screen below. Click launch! That's it! Now our Eclipse projects will be able to make use of the tween-engine-api. Here's the latest source code. It contains all the progress we made until Day 10, and the additional fixes that I asked you to make after Day 10, including the steps above. 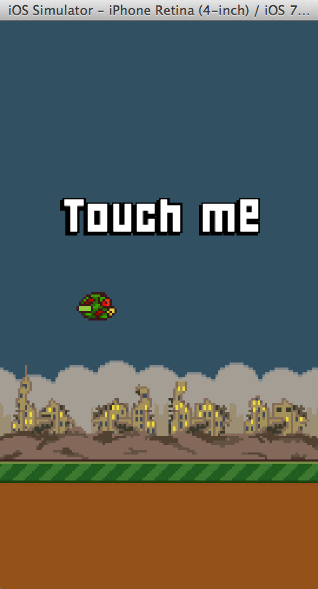 We will now setup our Android Project, so that you can start testing your game on Android devices. 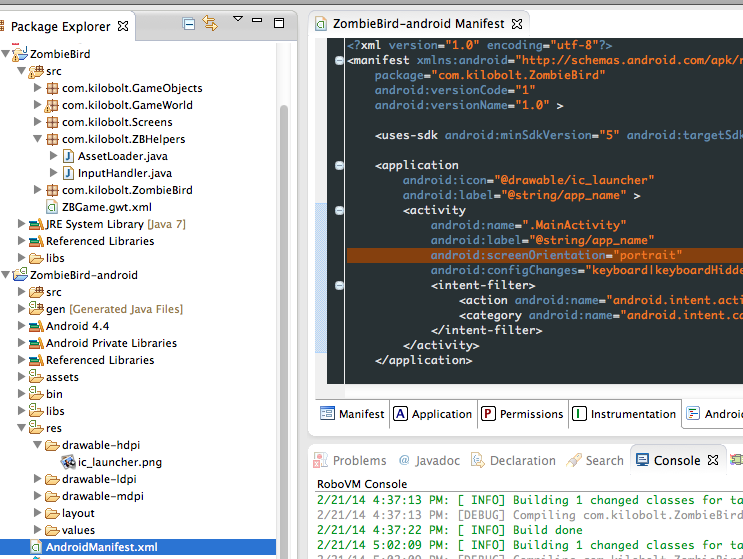 Open the ZombieGame-android project. The default libGDX screen orientation is landscape. We will be using portrait mode. 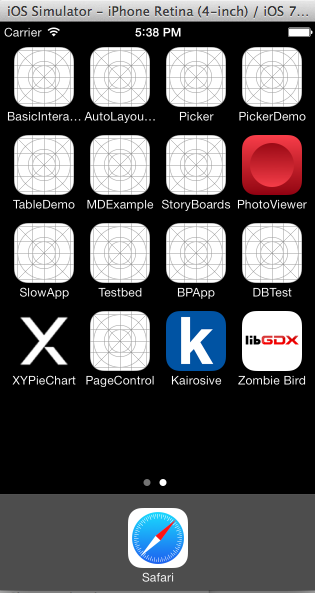 To test your libGDX game on iOS, you must have an Intel-based Mac. If you meet those requirements, we must setup RoboVM on our machine. 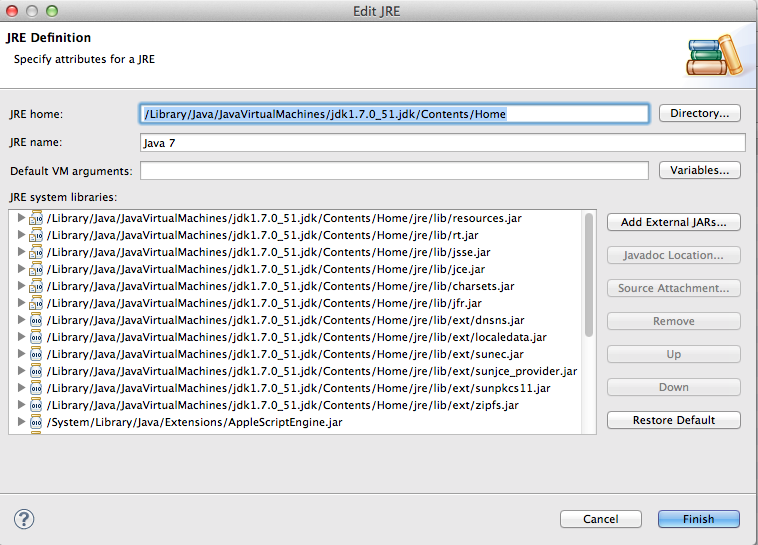 To do that, follow this link: http://www.robovm.org/docs#start and download JDK 7, Xcode and download RoboVM for Eclipse. Once that is downloaded, you must restart Eclipse. Make sure you open up Xcode once before proceeding. Then, restart Eclipse once more. When you start an iOS app, a default image is shown while the app is loading in the background to give the illusion that the app has loaded quickly. You can also set these in the data folder. 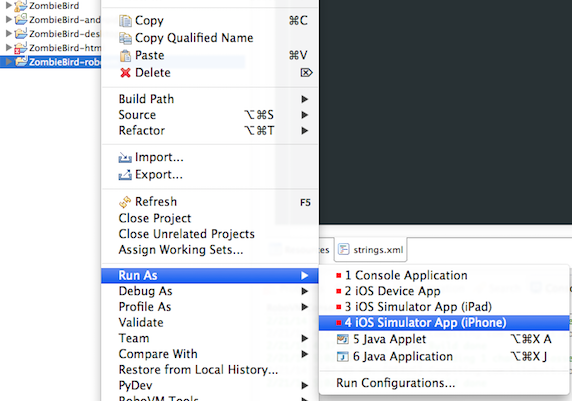 Once you run the application, it should start up on your iOS simulator as shown below! If you see a libGDX image, that's the default image that is shown when the game is loading, so that is normal! Begin by downloading these two texture files into your assets/data folder:. 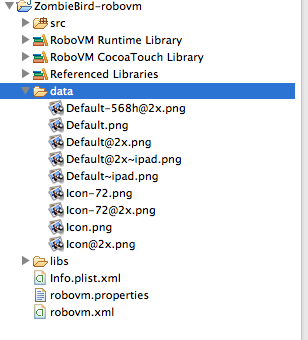 Create a new package called com.kilobolt.ui. Inside, create a SimpleButton class. We will use this for basic UI. Look through the code. It should be mostly self-explanatory. // It only counts as a touchUp if the button is in a pressed state. // Whenever a finger is released, we will cancel any presses. 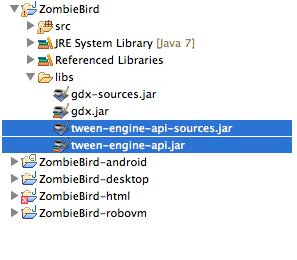 We have added the Tween Engine library to our project. Let's talk about what it does. The Tween Engine allows you to mathematically interpolate between a starting value and a final value. For example, let's say that I have some float called x, with a value of zero. I want to exponentially change this value to a final value of 1 (gradually increase from 0 to 1 at increasing speed). Let's add that I want all of this done in exactly 2.8 seconds. This is what the Tween Engine enables us to do. To use the Tween Engine, to mathematically interpolate these values to x = 1 and y = 5, you need to create a TweenAccessor called PointAccessor. This class will have two of your own methods. The first method is a getter. It retrieves the values of all the variables that you want to modify from the Point object, and stores it inside an array. Behind the scenes, the Tween Engine will receive these values and modify them. It will then return the modified values to you in the second method, where you can then send these new values to your Point object. The class above is an implementation of TweenAccessor, specifically for the Sprite class. 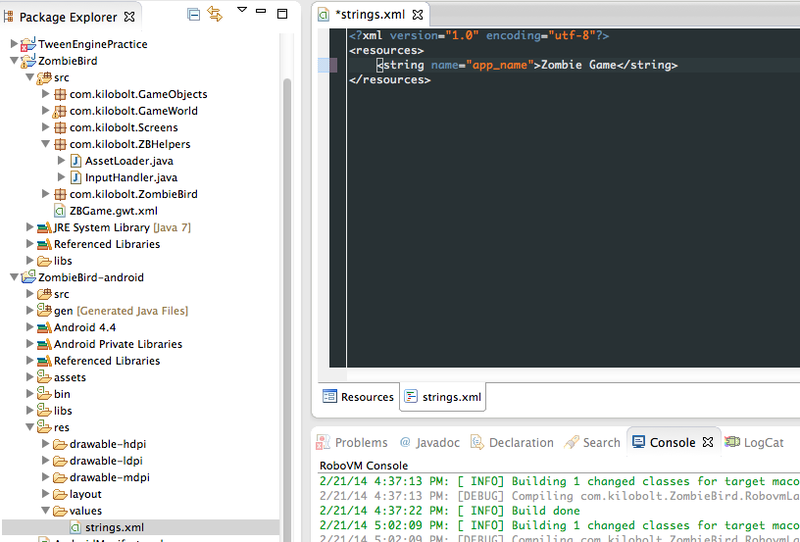 As I've previously mentioned, all classes that you want to modify using the TweenEngine need their own Accessor. The above TweenAccessor only modifies one variable (the alpha, or opacity). If we wanted to modify more variables in different ways, we would create more constants to denote other types of tweening that our Accessor is capable of (such as rotation). All TweenAccessors need to have two methods: getValues and setValues, which each target the specific class that you are tweening, in this case the Sprite class. Your role when creating a TweenAccessor is simple. 1. Retrieve the values that you want modified from the Object you are changing, and place them into an array. Let the Tween Engine do its work. 2. Then, you receive the modified values and send them back to the Object you are changing. 1. In the getValues method, you must retrieve all the values that you want to change from the Sprite object, and store them into the array of floats called returnValues. In this case we are only changing one value, so we can store it into the first index of returnValues: returnValues. Behind the scenes, this value is modified (brought closer to the final value that you have specified elsewhere). 2. After that, these updated values are available to you in the setValues method (in the same indices, or positions). Whatever you placed into returnValues will now be available as newValues. You next simply send this value back to the Sprite object. These methods are called automatically. You only have to provide the initial and final values. These will hopefully make more sense when you see this Accessor in action. Create a SplashScreen class inside com.kilobolt.Screens, as shown below. Now go back to the SplashScreen class. Let's focus specifically on the setupTween method, as the other code is mostly self-explanatory at htis point. 1. This line registers a new Accessor. We are basically saying, "I want to be able to modify Sprite objects using the Tween Engine. Here's the Accessor I made for it that follows your specifications (that we must have a getValues method and a setValues method)." 2. The Tween Engine requires a TweenManager to work, which is updated in our render method with the delta value. This manager will then handle the interpolation for us using our SpriteAccessor. 3. We can create something called a TweenCallback, which is an object whose methods are called when Tweening is complete. In this case, we create a new TweenCallback called cb, whose onEvent method (which will be called when our Tweening is finished), will send us to the GameScreen. Before we move on to the most important stuff, let's see what we are trying to accomplish. We are trying to take our logo sprite, start it at 0 opacity, increase it to 1 (100%) and bring it back down to zero. - This says: We are going to tween the sprite object using the SpriteAccessor's ALPHA tweenType. We want this to take .8 seconds. We want you to modify the starting alpha value (this is specified in the SpriteAccessor class) to the desired target value of 1. - We want this to use a quadratic interpolation (you will see what this does), and repeat once as a Yoyo (with .4 seconds between the repetition). This accomplishes the desired effect of bringing our opacity back down to zero once it hits one. This then says, use the callback that we have created above called cb, and notify it when tweening is complete. Finally, this specifies which manager will be doing the work. Now have a look at the render method and see what the manager is doing, and then run the code. This is probably very confusing! It's hard to understand until you have experimented with it, so before moving on, I encourage you to do some of your own experimentation. Now that you know how TweenAccessors work, create two new classes for your com.kilobolt.TweenAccessors package. The first class is a simple Value class, which will just be a wrapper class for one float. We create this because only Objects can be tweened (primitives cannot). So, to tween a float, we must create a class for it. The ValueAccessor will be used whenever we need to tween a float. For example if we want to flash a screen using a white rectangle with changing opacity, we will create a new Value object and tween it using our ValueAccessor. In fact, we are going to do this to smoothly transition into our GameScreen from the SplashScreen. We are going to make several changes to our GameScreen, which consists of the GameScreen class and its helpers: InputHandler, GameWorld and GameRenderer classes. To keep Day 11 short and to prevent this from becoming 3 separate lessons, I will only discuss the major changes made to the code. Most of the changes will be easy to grasp, and after a little bit of experimentation, you will understand their purposes. If you get stuck, do post in the comments! The big change to the InputHandler is that we will be generating buttons here. This is not the best way to go about doing this, but as buttons are heavily reliant on input, I have created them here. The role of the InputHandler is now to create the Buttons and to handle interactions with them, as shown above. I also created some methods so that we can scale the touches (which are currently dependent on screen size) to our screen size independent game world width and height. Now, touches at x and y will be reported using our GameWorld's coordinates. I also enabled the use of the Spacebar for those who want to use the keyboard. To handle the changes to the constructor, we must now go update our GameScreen class. The changes here are minor and I will let you review them. :) (Notice the change to the renderer.render() call). This was accompanied by minor changes in the Bird class and the ScrollHandler class. // Set the circle's center to be (9, 6) with respect to the bird. The biggest refactoring occurred in the GameRenderer class. However, the changes are minor. Look through the code above and let me know if you have any questions! There's still work left to be done in terms of UI. Here is how we will proceed. I will post the sample code for the finished game as Day 12, which will have all the UI completed. This will be the end of Unit 1, which aims to mirror the Flappy Bird experience. Then we will begin Unit 2, integrating the requested features such as leaderboards and Facebook integration. Thank you for reading, and like us on Facebook or follow us on Twitter to stay updated!